The new Mercedes-Benz 2014 CLA 250 Sport models are out and they will live up to the Sport badge. Mercedes just launched the new 2014 CLA 250 Sport, and “Sport” is more than just a badge on the front fenders of these new "AMG Line" models. Whenever AMG gets their hands on a new model, we can expect good things underneath the sheet metal. The new 2014 CLA 250 Sport will be "Engineered by AMG" and can be ordered now in Europe. 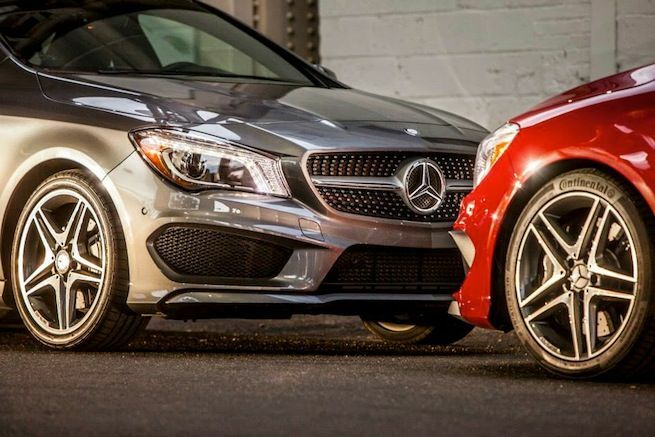 What did AMG do to these CLA-Class models to set them apart? The new Sport models are powered by the same 2.0-liter engine as in the standard CLA that generates 155 kW (211 hp) and maximum torque of 350 Nm. But that’s where the similarities end. Two models will be available, the CLA 250 Sport and CLA 250 Sport 4MATIC, and both will come mated to a sporty 7G-DCT dual clutch transmission. Underneath the sporty four-door coupe styling, AMG has developed goodies for the suspension to improve the driving dynamics of the CLA. The CLA Sport will get a special Mercedes-AMG front axle and an AMG sports suspension that has been tuned to match, plus AMG speed-sensitive sports steering. Special engine and transmission configuration, as well as modified ESP® intervention, will also enhance sporty driving characteristics. The exhaust system will feature a unique exhaust note that is “more emotional” thanks to a modified Sport exhaust system. The new Sport models also get exterior treatments to set them apart. The equipment line "AMG Line" is standard, with "Sport" badges embellishing the front fenders. They are also shod with 235/40 R 18 tires on all four corners and have red-painted brake callipers peaking out the exclusive, black-painted 18-inch AMG 5-spoke light-alloy wheels. In addition, red detailing on the AMG front and rear aprons further underlines the dynamic positioning of these new CLA Sport models. The highlighting effect is carried through into the interior, with designo seat belts in red and floor mats with "Sport" lettering. Pricing on the Mercedes-Benz CLA 250 Sport starts at 42,304.50 Euros and CLA 250 Sport with 4MATIC 44,506.00 Euros. Mercedes also just launched the new 2014 CLA 180 CDI diesel with a low starting price of 31,178 euros. The new Mercedes-Benz compact models have already been very well received by customers around the world, and since the start of the year they have shown a sales increase of more than 60 percent against the previous year. Look for the new 2014 Mercedes-Benz CLA Sport models that share the catchword, "Engineered by AMG" to be equally as popular with a new generation of driving enthusiasts.